If you thought televisions were the only ones to say goodbye to flat screens, then here’s more. Mobile phones are also gearing up to bid adieu to the flat surfaced display and welcome a new era of flexi screens! Powered by OLED (organic light-emitting diode) technology, flexible display screens are being manufactured for smartphones. This has industry analysts predicting the OLED market to grow from the current $2 billion market to a bullish $57 billion by 2026. Revenue forecast of plastic and OLED displays across market segments. With such widespread acceptance for flexi screens coming forth, universities and industry players have begun a race to develop this technology. Researchers at Tohoku University have developed a super flexible liquid crystal (LC) device by firmly bonding two ultra-thin plastic substrates using polymer wall spacers. On another front, researchers at Stanford University are developing techniques to manufacture flexible displays by using molybdenum disulphide. The foldable full screen of the iPhone 8 is well hyped and much known. Apple was recently granted a patent No. 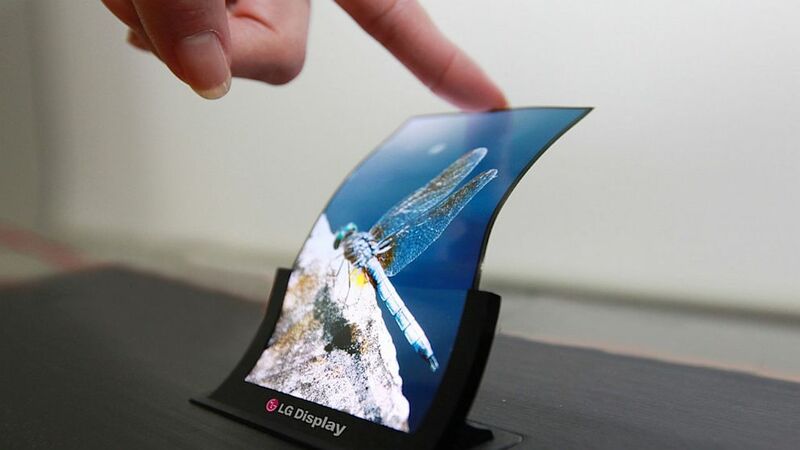 9,504,170 for its technology on Flexible display devices that allows a smartphone to fold its display. US 9,504,170 B2 describes a structure of the flexible displays. The patent especially describes movable parts on the screen using a hinge mechanism with a three-bar linkage agreement. This allows the device to be folded back to back, rotated in a particular direction or slide along a surface offering a customized display. The above images from the patent show a flexible display which can be used in a multitude of electronic devices, including laptops, smartphones, wearable devices and even earpieces and pendants. With curved television screens becoming the new tech fad, this flexible display technology can also better such gadgets. LG Display launched a prototype 18-inch OLED screen that can offer high definition view and can also be rolled into a 3cm radius. Such foldable screens will benefit smartphones, tablets, and TV makers as the device can be rolled up and inserted into a pocket. LG is all set to launch these flexible and transparent OLED panels measuring 60 inches in the coming year. LG Display’s flexible and transparent prototypes. Samsung is a leader in display screen technology and owns several patents in this space. While its tech has been a technocrat’s teaser, it’s recently granted a patent for a display screen design that enables making foldable smartphones is set to usher in a new era for the smartphone industry. Samsung’s foldable screen prototype and a patent diagram describing this technology. It is rumored that Samsung is working on bendable and foldable smartphones under a task coded “Project Valley”. With LG showcasing its prototype at the CES 2016 and Samsung rumoured to release its prototype next year, smartphones that can roll into a scroll are set to revolutionize the OLED industry in a big way.